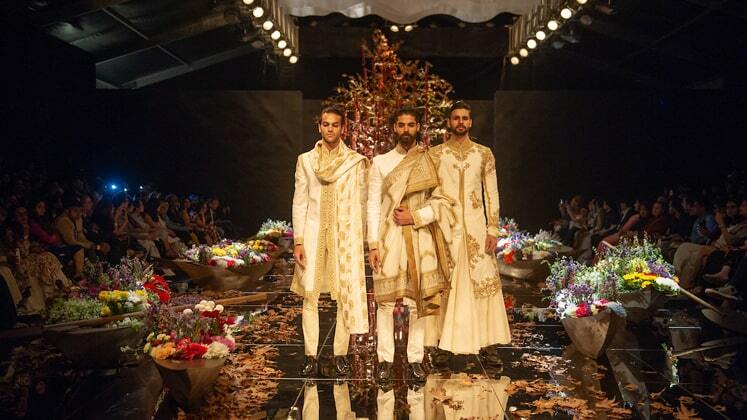 Shikaras overflowing with fresh blooms strategically positioned over a glass ramp sprinkled with chinar leaves, made for a scene reminiscent of Kahmir as designer Rohit Bal presented his Summer Resort collection in association with Usha Silai Project at Lakme Fashion Week 2019, happening in Mumbai. Opulent and graceful, Bal’s silhouettes are emphasized with vibrant larger than life motifs of sunflowers, poppies, tulips and peonies, set against ivory and black surfaces. The womenswear offering showcased long, flared, floor-grazing kurtas, stately jackets, cropped flared blouses, capes, quilted boleros, mini kalidar kurtis and fluted-sleeve corset blouses. The menswear collection represented motifs and line drawings of galloping horses on indigo bundgala jackets, embellished with embroidery. The Usha Silai Project has empowered hundreds of women all over India by teaching and providing them with relevant knowledge. Along with Rohit Bal, Usha Silai Project presented the work of Aliya Ali, the youngest girl in the Kashmir Cluster, Firdosa Jaan, Umilla Manzoor Sameena Rasool, a computer engineer who has a flair for designing and Nushrat Khan from Srinagar. The collection would be available for purchase at Rohit Bal stores.